The ideal satellite broadcast coverage is one that transmits a signal to a broadcaster’s intended viewer base. The entire population of Canada, United States, Northern Mexico, and Northern Caribbean can be served by the satellites providing a signal from the Glorystar Free Christian Broadcasts – that is over 480 Million people! The satellite owner estimates that currently there are 5 to 7 million people watching Galaxy 19. Of these viewers an estimated 2 million households have specifically purchased equipment to receive these free Christian satellite channels. 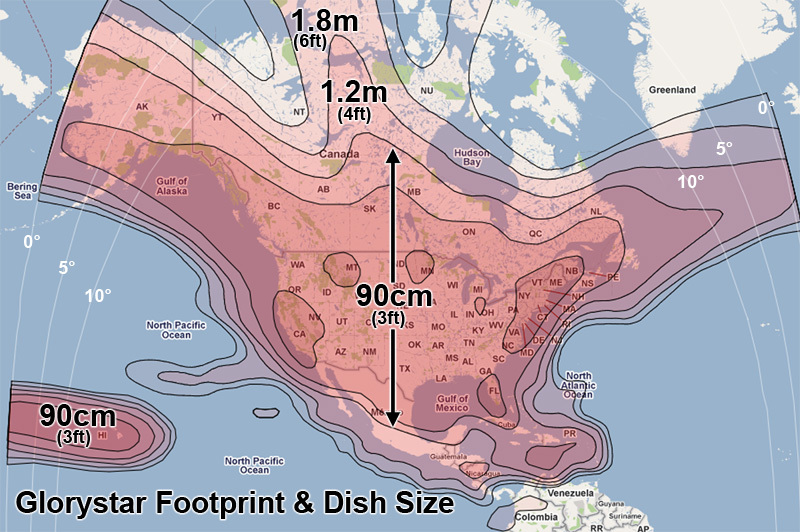 The maps below show a generalized “Footprint Map” of the satellite signal over the population of North America. If you are outside of 90cm (3ft) dish size area of coverage, please call Glorystar to determine proper equipment for your region.